Philadelphia 76ers center Joel Embiid soars to the basket against New York Knicks small forward Tim Hardaway Jr. during the fourth quarter at Madison Square Garden. The Sixers should be expected to beat the Knicks at full strength, let alone in the depleted state their rivals to the north are in. They have a better roster, a better coach, and no excuses to fall back on. That didn't matter for most of the game, with New York hitting a ton of flukey mid-range shots and the Sixers not paying much attention to detail on defense otherwise. But somehow, some way, they found a way to emerge as the victors when it was all said and done. 118-110 looks like a comfortable final scoreline, and it was anything but. Somehow, the Sixers gave up 68 points in the first half to a team starting Emmanuel Mudiay, Courtney Lee, Tim Hardaway Jr., Michael Beasley, and Enes Kanter. That's really hard to do. A good deal of that came down to unsustainable shot-making from a bad team: the Knicks shot 50 percent from the game on long two's, the worst shot in basketball from an efficiency standpoint. Points are points though, so it got the job done until the fourth quarter rolled around. The Sixers, on the other hand, shot poorly on those same mid-range shots, excelling instead in the two areas of the court modern teams emphasize: the rim (70.4 percent, per Cleaning the Glass) and the three-point line (40.5 percent). Combined with their emphasis on getting to the free-throw line, the Sixers beat the Knicks with math. They also beat them because they had the two most talented players on the floor. Ben Simmons had an uneven game, but he still managed to come up with his eighth triple-double of the season with 13 points, 10 rebounds, and 12 assists in 33 minutes of action. The Sixers put him in the post early in the game, asking Embiid to space the floor while he carved up the Knicks inside. It worked beautifully, with Embiid scoring 19 points on mostly jumpers in the first half and Simmons piling up assists using his court vision. Brown was complimentary of his two stars after the game, but he was also cognizant of the fact they shouldn't have been in a close game with the Knicks in the first place. "I thought in the second half he raised his intensity," said Brown. "For a while, I was worried, we had to raise our intensity. I thought Ben and Joel helped lead that cause in the second half especially ... [but] there needs to be more of a sense of urgency to trend in the way we want to trend, as the exciting part of the season comes closer." It can never just be easy for this group. Even when they're making great team plays in crunch time, they walk that razor's edge and expose themselves to danger they don't really need to. Simmons made one of the more insane passes you'll ever see with the Sixers in front by just a single point late in the game, when he didn't hesitate to hit Covington with a cross-court laser in transition. Lee read the play, and tried to jump it, but it came in so hot that his effort left JJ Redick open in the corner. That was the ball game. In many ways, that play is a microcosm of this season. You ooh and ah that Simmons was able to accomplish that in an NBA game, while also suppressing screams about ball security in a tight game. I suppose it's easy to play fast and loose when you know you have Embiid on your team. He was a dominant offensive force throughout the game, piling up 29 points, 10 rebounds, and four assists on 11/21 shooting, but it was the defensive end where he shut things down in the second half. New York kept trying to test him in the guts of the game, and Embiid took it as a personal insult that they'd dare to challenge him. He is everything you could ask for in a defensive player, the size, and athleticism combined with instincts and passion that have him standing over dejected drivers like Chris Tucker in Friday. For years, the tanking Sixers lost games of this variety by coughing up shaky leads to teams that were better than they were. It's a bit surreal to see the Philadelphia squad on the other side of that equation these days, but at this point perhaps we should be getting used to it. Simmons' assist count might have been representative of his passing impact on Thursday evening, but I don't think Embiid's four assists come anywhere close to showing off what he offered. 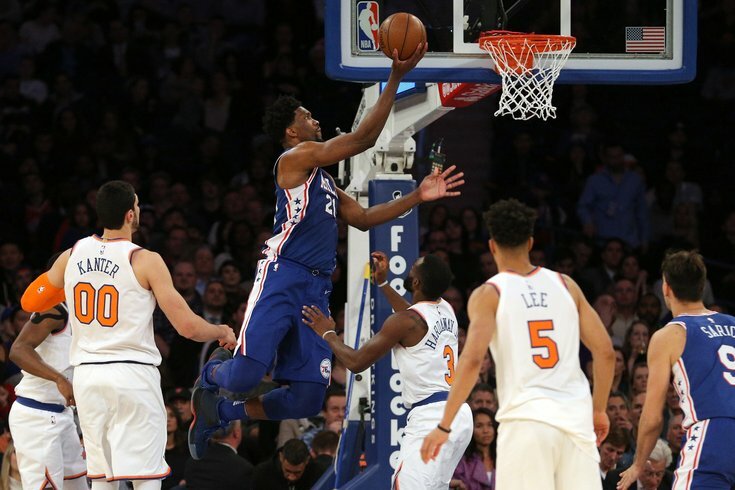 After an eight-turnover game against the Pacers, Embiid cut that number down to three against the Knicks, and he did so by making quicker and smarter decisions with the ball in his control. When Embiid runs into trouble in the post, it's usually because he instinctively starts dribbling before assessing what's around him. Teams exploit this by sending quick doubles from the weakside, poking the ball away before he can even get anything going. Embiid avoided this against the Knicks by keeping his dribble in his back pocket, using his pivot foot to face the crowd and hit quick, easy passes to open guys, which set off chain reactions that led to good looks. The instinct for Embiid to take his guy one-on-one all the time is understandable because he's a walking matchup nightmare, but this is the key to unlocking the game for himself and others. If players move without the ball and he focuses on taking the path of least resistance, results will come and turnovers will drop. He doesn't need to get an assist for his passing to be a weapon. Off-ball movement can't be understated in this equation. Embiid can face up and assess the court all he wants, but if guys are just standing around expecting for him to create something, the offense is going to suffer for it. Thankfully, Simmons and Dario Saric have learned to play off the big man, and Simmons' time as an off-ball power forward as a younger player has served him well in the NBA. He was aided by the Knicks, well, having no effing clue what they were doing on defense, but Embiid used one dribble to free himself and hit him for the easy basket. These sort of plays are revealing because they show that Embiid doesn't have to reinvent the wheel to hurt opponents with his passing. Sometimes, all it takes is making the quick and fast read to get buckets, and he would do well to remember that. It was a brutal night at the office for both the wing shooters the Sixers have on hand, but Covington and Saric made you forget about how poorly Redick (2/8) and Marco Belinelli (0/3) shot from downtown. When the Sixers have this core four players getting it done at the same time, it makes you dream about how could they could be if they just get one more guy to push them over the top, rounding out the team that will compete for years to come. There have been a lot of debates about Covington's defensive value lately, but frankly, I don't know how you can watch him play night in and night out and come away unenthused by his defense. He pokes balls loose, he switches to help teammates, he hauls in defensive rebounds, he blocks shots on the perimeter and at the rim, he does it all. It's easier for everyone to focus on that defense when Covington has it going on from three, and he is back in his comfort zone after a long midseason drought. Covington put up a lot of early clock threes against the Knicks, which feel awful when they don't go in but pretty spectacular when you get them to drop. The Saric experience, by the way, has been absolutely fantastic this season. He has been in a zone ever since the calendar turned to 2018, and it's more of a surprise when he doesn't make a three these days. What we haven't seen much of is the swagged out, celebrating Saric we saw during his younger days in Croatia. He has been fiery and intense as ever in a Sixers uniform, but there's been a lot less dancing and singing. Finally, mercifully, he unloaded a pinwheeling strut down the sideline when he iced the game with a three, as Covington stared back at him flashing three signs with both hands. Sometimes it is to their own detriment, but these guys play with no fear. The same instinct that causes maddening turnovers allows them to forget mistakes and move on to the next play, unafraid to pull the trigger in a big moment. That stuff matters, and the Sixers will need that mentality in late April.